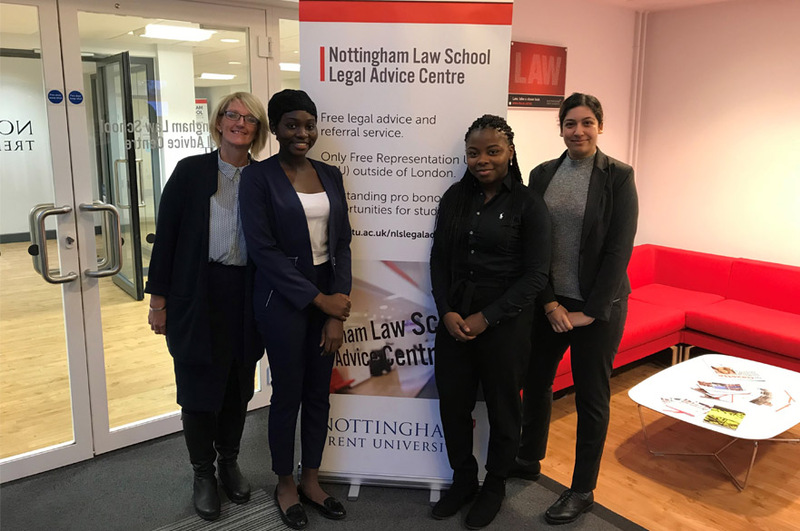 The Nottingham Law School (NLS) Client Interviewing Competition concluded with the final at the NLS Legal Advice Centre on Wednesday 15 November 2017. The student teams were judged by Faye Deverell (Senior Supervising Solicitor at the Legal Advice Centre), Julie Higginbottom (NLS Pastoral Advisor) and Helen Taylor (Senior Lecturer) on a tricky contract law scenario. Junely Coker and Harnaam Bassan were announced the winners, with the runners up being Tara Meats and Cindy Boateng. Deputy Dean, Jenny Chapman presented all the finalists with their prizes. The counselling part of the interview was given particular focus in relation to the viability of client options. A number of creative solutions were proposed by the teams with a focus on client need, financial and emotional impact being assessed and explained. A team will now progress to take part in the National Client Interviewing Competition.